Finally got a chance to sift through my images from my trip to Missoula and Denver. Here’s what it was like at Denver International Airport on May 1, which was my outbound leg. The airport was closed down for almost an hour due to heavy, blowing snow. Then we were number six in line for de-icing at twenty minutes per plane. 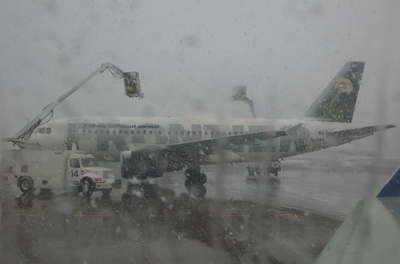 Had never seen de-icing before, won’t mind if I never do again- Happy May Day? My camera luck ran out in Missoula. Digital SLRs and lenses don’t go well with pavement, so one of the Nikon D70s and the 28-300mm go in for repairs today. In the meantime, I couldn’t stand the thought of going to the Denver Zoo sans camera, so I went to a nifty camera store in Missoula and bought a Nikon Coolpix S10. Same file size as the D70, 6mg, 10x super zoom, decent “shutter” speed, supposedly. Well, we’d see about that. Fifty bucks for a 2gb card and I was set, I hoped. I really put it through its paces and I’m very impressed. It wouldn’t do the job out in the field, too slow, but for anything that isn’t moving too fast, it did great! Here’s two images that will show what it can do. The first was through plate glass with no polarizing filter. 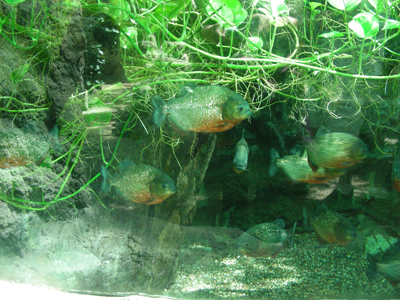 And yes, those are piranha. 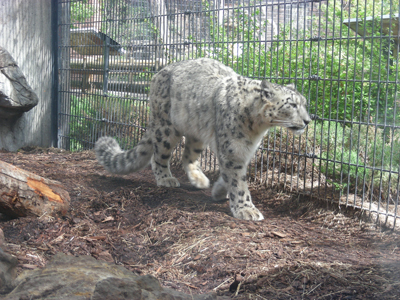 The second is a snow leopard who was pacing back and forth waiting for mealtime. I couldn’t get quite what I wanted in terms of variety of leg position, but the focus was decently sharp. The image is more than good enough to use for reference. 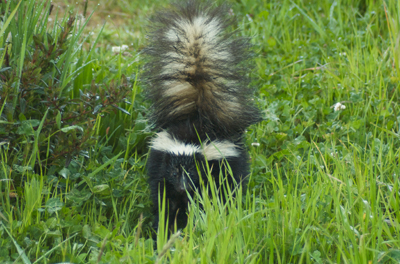 And finally, A RECENT VISITOR, at 7:30 in the morning a couple of weeks ago out by the pond. Niki and two of the cats came out with me to see what was going on. We all went our various ways without incident or excitement. New Paintings, Book Review, Camera Drama cont.